In PERSISTENCE of MEMORY, an older Jonas looks back at his youthful indulgent one-year adventure with the ingenious Salvador Dalí, and his astute, lascivious wife, Gala. This Mexican boy was young, beautiful, and filled with dreams of becoming a famous dancer, but the frills of celebrity sucked the very marrow out of him. 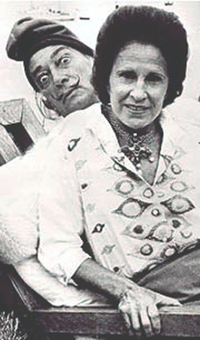 PERSISTENCE is a rapturous one year adventure in the company of most authentic yet extravagant, Salvador Dalí by the side of his shrewd muse, Gala. See research videos on the DALIS. "Mistakes are almost always of a sacred nature. Never try to correct them. On the contrary: rationalize them, understand them thoroughly. After that, it will be possible for you to sublimate them." "In order to acquire a growing and lasting respect in society, it is a good thing, if you possess great talent, to give, early in your youth, a very hard kick to the right shin of the society that you love. After that, be a snob." "I am painting pictures which make me die for joy, I am creating with an absolute naturalness, without the slightest aesthetic concern, I am making things that inspire me with a profound emotion and I am trying to paint them honestly." "I do not paint a portrait to look like the subject, rather does the person grow to look like his portrait." "I don't take drugs: I am drugs." "The difference between false statements and true ones is the same as for jewels: it is always the false ones that look the most real, the most brilliant until you look closely. "I have Dalínian thought: the one thing the world will never have enough of is the outrageous." "There are some days when I think I'm going to die from an overdose of satisfaction." "Those who do not want to imitate anything, produce nothing." "When I was five years old I saw an insect that had been eaten by ants and of which nothing remained except the shell. Through the holes in its anatomy one could see the sky. Every time I wish to attain purity I look at the sky through flesh."